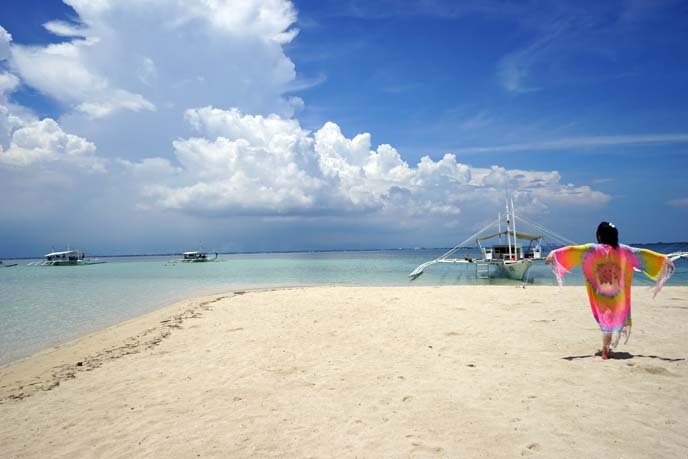 Sailing, Snorkel & Seafood in Lapu-Lapu, Philippines! 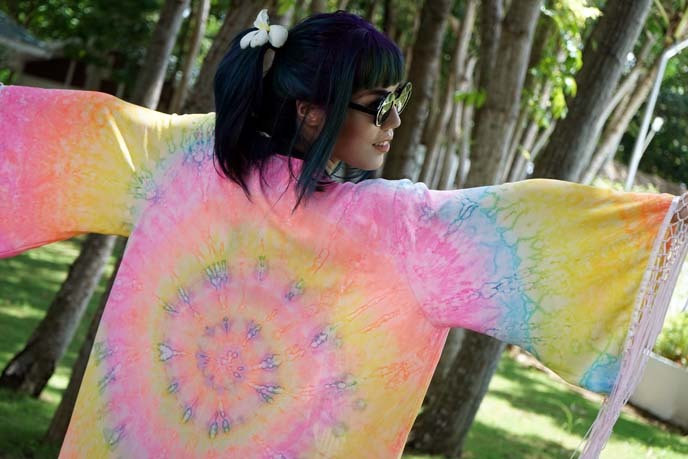 Unif rainbow kimono. 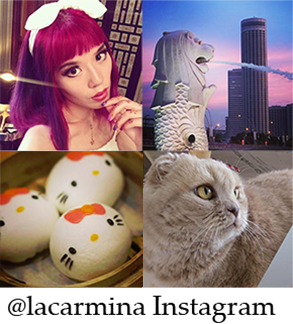 I chalked up a lot of amazing travel memories this year, from the lost city of Petra to petting owls in Japan. 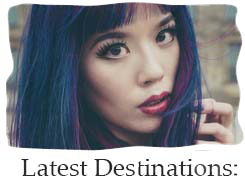 However, one of my absolute favorite days of 2014 was the one I’m sharing with you now. My team and I were in the Philippines to film a video about Pacific Cebu Resort (did you see my post about this gorgeous place?) 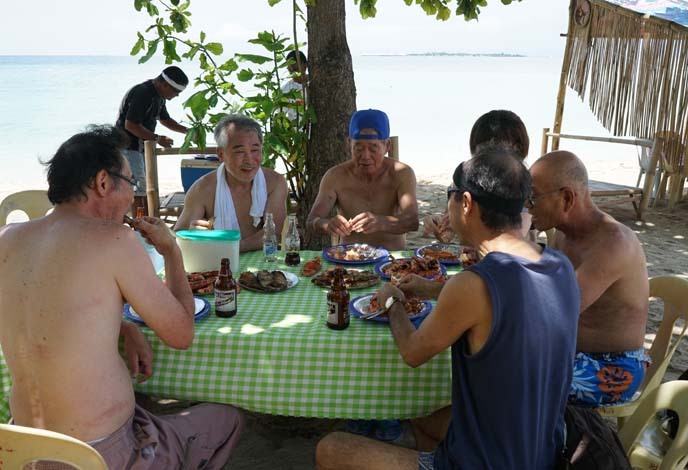 We met the mayor of Lapu-Lapu — one of the biggest cities in Cebu — and she arranged for her tourism board to take us on an island-hopping beach excursion. I’m all smiles before we sail away for the day. I wore Ksubi Bellatrix sunglasses from West LA Boutique. 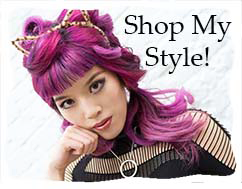 Love the anime-Goth round shape of the glasses. 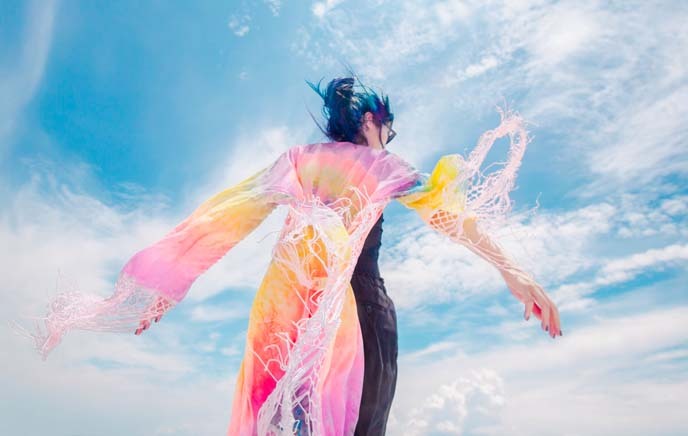 There’s no better backdrop for this Unif rainbow tie-dye robe, also from West LA Boutique (check out their fabulous online store, which carries brands like these). It’s the perfect swimwear cover-up, with a fringe that moves in the wind. Unif also makes a rainbow tie-dye skirt and colorful sneakers. 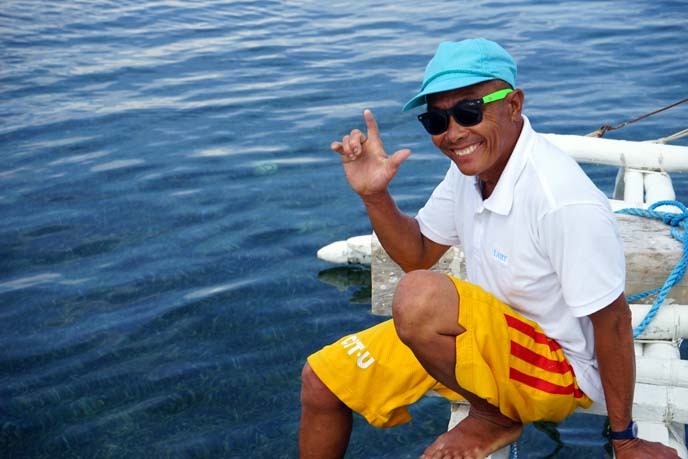 We met our Lapu-Lapu guide, and hopped onto a boat. I walked the front plank like a pirate, and let the wind blast through my robe and hair. A Titanic moment, at the bow of the boat. How I love my Technicolor dream coat. About 30 minutes later, we docked at Caohagan Island. I couldn’t believe my eyes: white sand, pristine waters, and almost no-one else there. 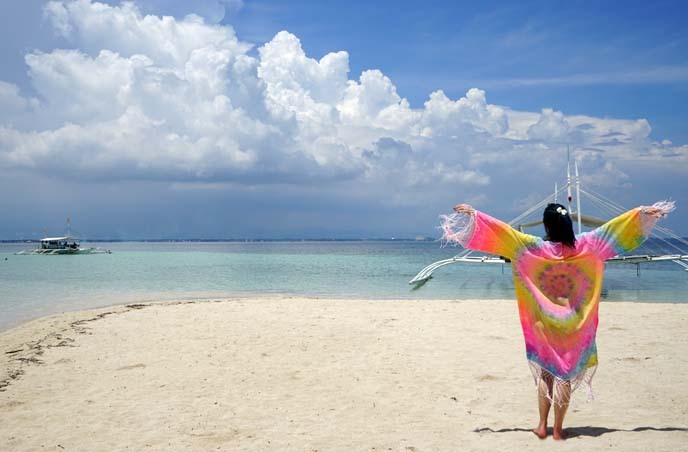 Travelers tend to overlook Cebu as a beach destination, which is a mistake. It’s not expensive to stay in the Philippines, and you get a far more authentic experience than if you went to a place like Phuket, which is over-run with tourists. There aren’t any Starbucks on this island. 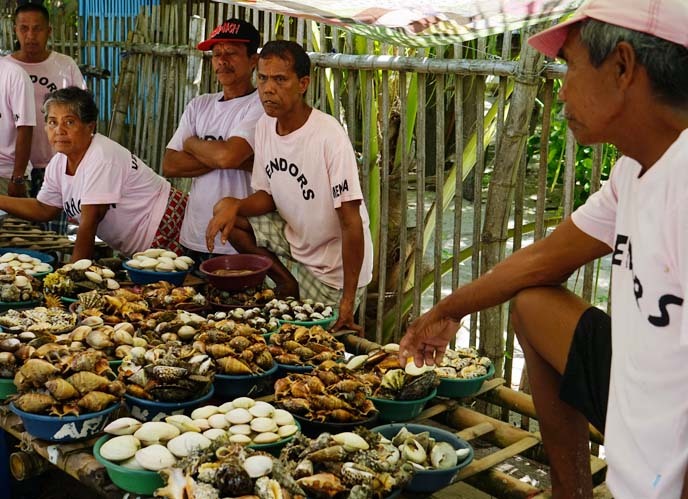 You pick your seafood fresh from the local vendors, and they’ll cook it up for you. 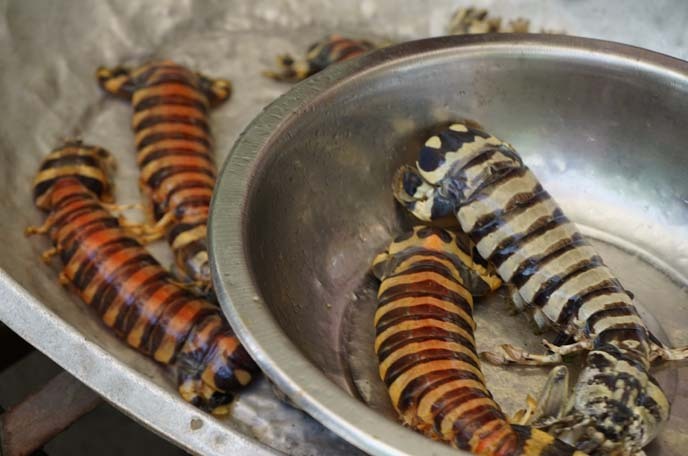 What on Earth is this striped sea-creature? 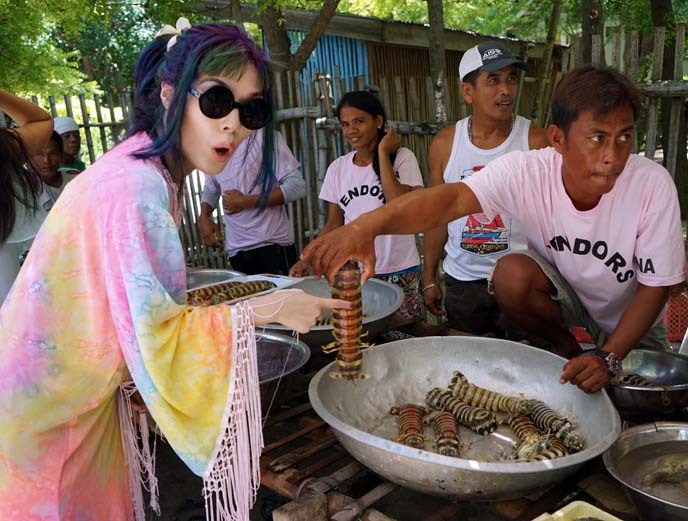 It’s a mantis shrimp, a lobster-like Southeast Asian crustacean. They move in a creepy-crawly way, as you can see in my Instagram video. I find it thrilling when I come across local food that I can’t recognize. Not sure exactly what type of conch and clams these are, but I’m willing to try. 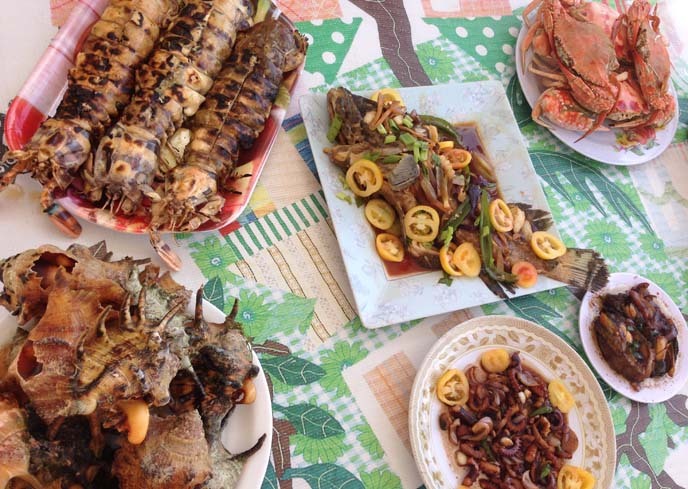 Our Lapu-Lapu tourism rep took charge and ordered a selection of seafood for us to share. 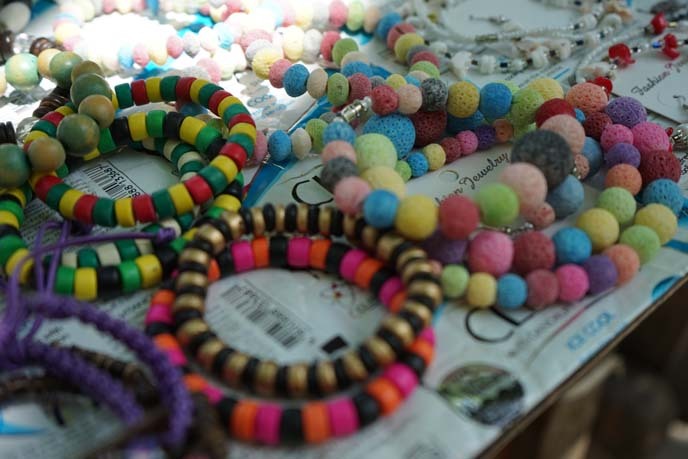 While we waited for our meal to be cooked fresh, we browsed other stalls that sold handmade jewelry. The Philippines is an easy destination to visit because many locals speak English, and accept American dollars as currency. Black Mustache meets Rainbow Brite. Filmmaker Melissa and I waded into the calm and warm shore. The waters are so shallow in Lapu-Lapu that you can walk between some of the islands during low tide! Here’s a shot of my skeleton-print swimsuit, similar to this ribcage one in black and white. 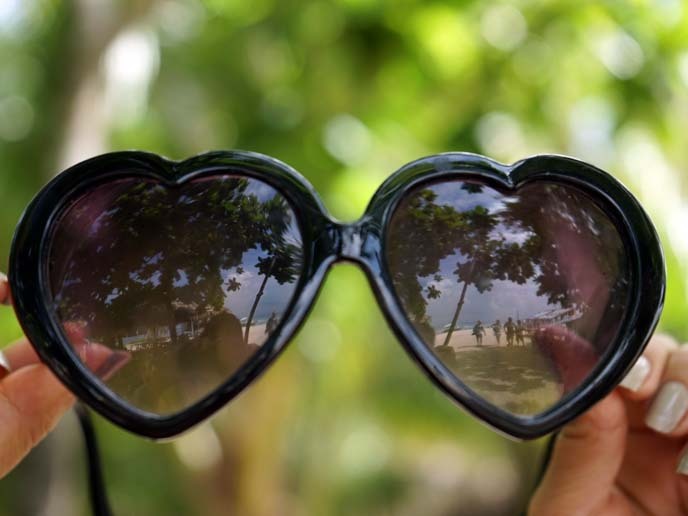 In the reflection of Melissa’s heart-shaped sunglasses (get them here), you can see the palm trees and beaches of Caohagan. Apparently, these Japanese men are in on the secret! 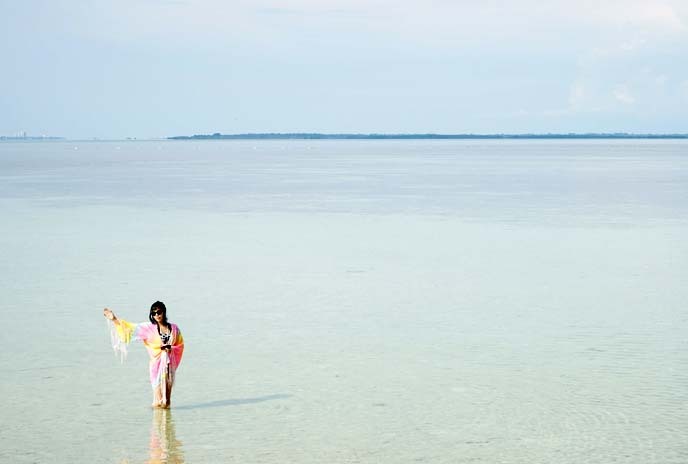 Cebu is not far from Japan and Hong Kong, but still, not many people think of it when they plan a vacation. Time to chow down on seafood, lightly seasoned with Asian flavors. 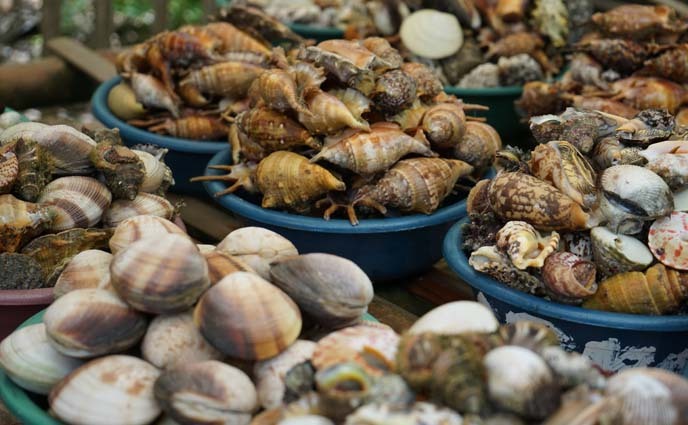 Crab, squid, fish, abalone, mantis shrimp, conch… I’ll let the photo above speak for itself. After, to wash off, all you need to do is jump back into the ocean. Ah, the island life! Only a few hundred people live on this tropical isle, mostly working as fishermen and craftspeople. I enjoyed seeing how the residents of Caohagan lived. 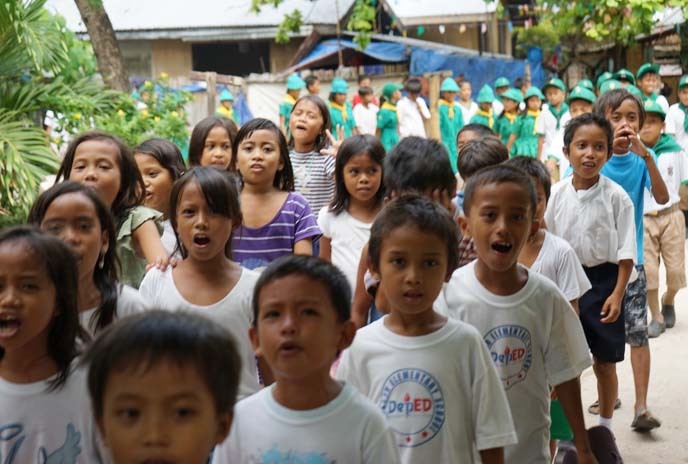 It didn’t take long to walk across the barangay (or village). 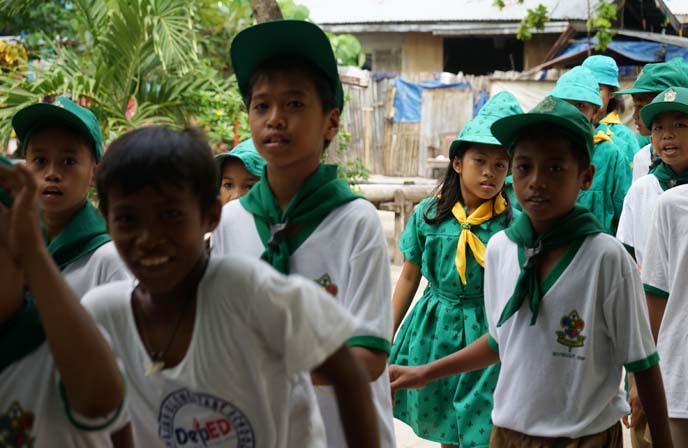 We ran into a lively parade of Filipino schoolchildren! They all waved and smiled at us. So sweet, these school uniforms. 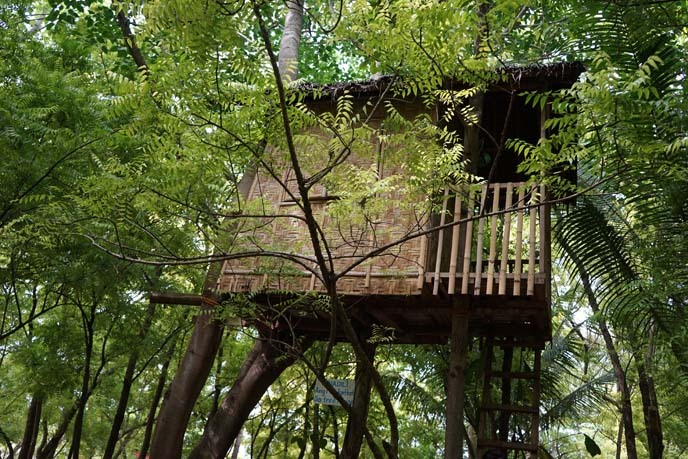 Aren’t you tempted to climb this treehouse, camouflaged by leaves? 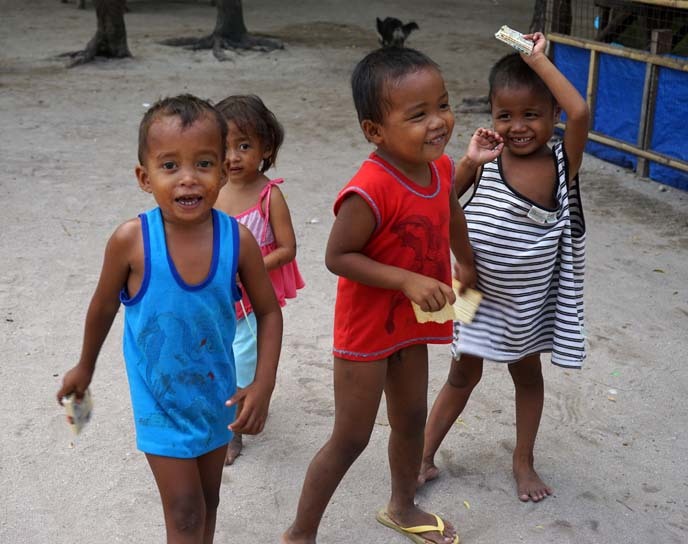 These children insisted on posing for photos. I must have taken a dozen snaps of them. Sad that we had to leave Caohagan, but there were more islands to explore. 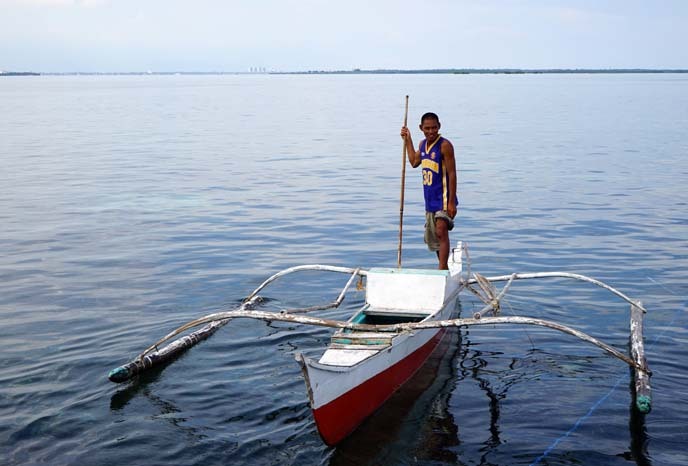 Since the waters were so shallow, we had to ride this little “jukung” in order to board the larger “banca,” or pump boat. By now, I’m sure you see why this Lapu Lapu adventure was one of my favorites this year. 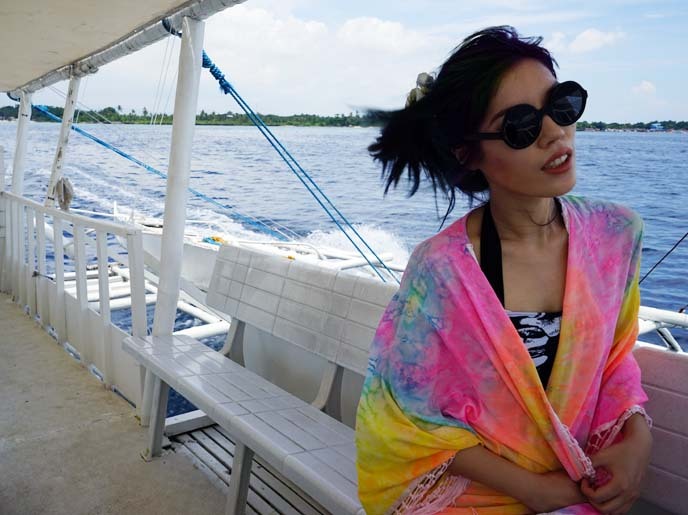 Cebu’s weather is humid, and I was glad to cool off during the boat ride. We arrived at Nalusuan Island, a resort and marine sanctuary. 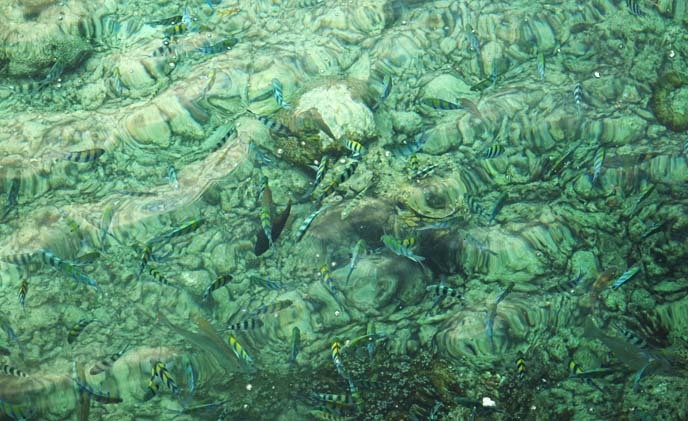 Located in the Olango Reef, these waters are rich with sea life. Case in point: this is what the sea floor looked like, from the pier. 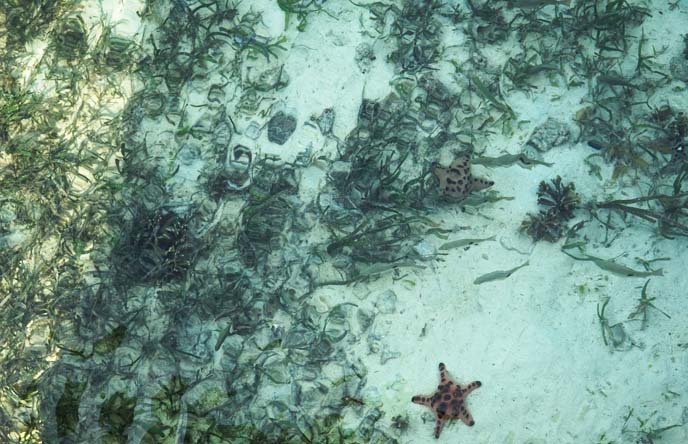 How many starfish can you count? Sipping a fresh coconut in the Philippines, under waving palm trees. If this doesn’t convince you to come here, I don’t know what will. Cebu has it all. Marine diversity, snorkel and scuba, white beaches, clear waters, an intriguing culture, flavorful local food… and at much lower prices than Bali or Bangkok. 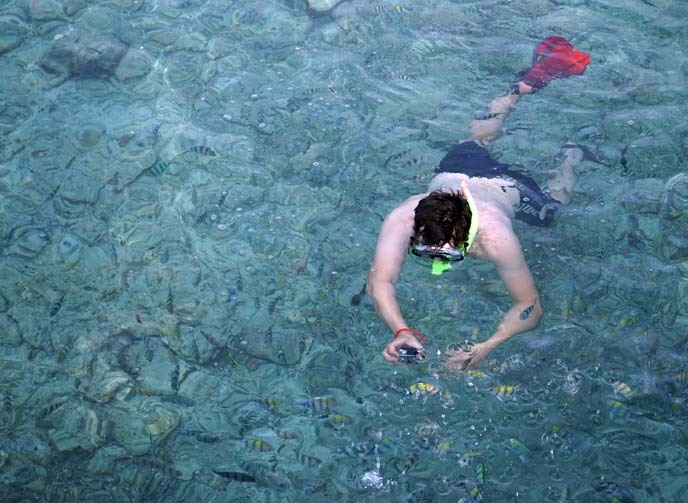 As I mentioned before, I have some eye and skin sensitivities that make activities like snorkeling impossible. Melissa and I stayed on shore and threw fish food at Eric, and he filmed them splashing around. He used a Go Pro underwater camera to capture the experience of snorkeling. We’re excited to show you the fish in action, when we release our travel video. Huge smiles for Lapu-Lapu — what a perfect day! None of this would have been possible without the sáv Hospitality team, which brought us to Pacific Cebu Resort. How do you like my rainbow Gothic beachwear? Were you as surprised by Cebu as I was? This is seriously the BEST DAY EVER!!! it was!! and more to come! we were pleased to have you here as well! hope can see you soon! loving your enthusiasm. and the fashion!!!! I’m sold. The Philippines is now on my ‘To Visit’ list. Thanks for the outfit photos! Looks great. You’re so cool! This is grand. haha true, I was glad to get some cool wind from the sailing! I am like beyond happy because you visited my country.